Healthy blending enables us to not only look good, but to feel good and to maintain health. We are prone to try various supplements, go to the local gym to work out, and read tons of literature on the subject. That may all be fine and good, but there is a simple way to help capture health right in one’s own kitchen. It’s a given that we are to discard empty calories and replace them with whole grains, fruits and vegetables. We hear it touted almost every day. But by the time we discard peels, pulps and seeds, as much as 86% of nutrients are lost. Then some nutrition is locked inside cell walls that aren’t broken down enough to be digested and absorbed. Making whole food meals with healthy blending may give you the ammunition needed to avoid obesity, high blood pressure, cancer, arthritis, high cholesterol, flu, colds, heartburn and stress. The food industry advertises that using processed foods packed with additives, preservatives and fillers can save us time and money. Not so! Why pay out money for the extra packaging and processing when fresh whole foods have power to get you on the road to longevity and health? Not only that, but they can be more interesting and delicious as well as nutritious than you thought possible. Just yesterday, my husband and I made 100% whole wheat bread, yes bread, using our blender. It turned out light and fluffy and was done in a little over an hour. Then there are fruit smoothies to consider. Blackberries and raspberries are loaded with disease-fighting fiber. A 3/4 cup serving gives 6 grams—more than oat bran flakes. Bad cholesterol is swept away from your body and insoluble fiber prevents constipation, aids your heart and fights cancer causing carcinogens. Researchers at Ohio State Comprehensive Cancer Center said the ellagic acid found in the seeds of both berries was a powerful cancer preventative substance. Since our teeth can’t break down berry seeds, they usually go through our bodies undigested. What your Vita-Mix can do is pulverize the berries—skins, seeds, and all—giving you all their disease-prevention power. And don't forget the power of "green" in smoothies. Try putting some pineapple in your blender first, then maybe an apple. Pile on dark leafy greens such as lettuces, spinach, chard and the like, and add water, juice or nut milk. If you like a milk shake thickness to your smoothie, a banana or an avocado will do it. Some folk like to add sunflower seeds or pumpkin seeds for added protein. Blend and enjoy. At times, I've made a greens and water only smoothie for a pick-me-up, and added a dash of Celtic sea salt and some stevia to take away the raw green taste. Or make a pure, fresh juice or nut mylk with the blender and a Juicerless Nut Mylk Bag. Take a look here and find out more how healthy blending can help you feel good, look good, and maintain your health. 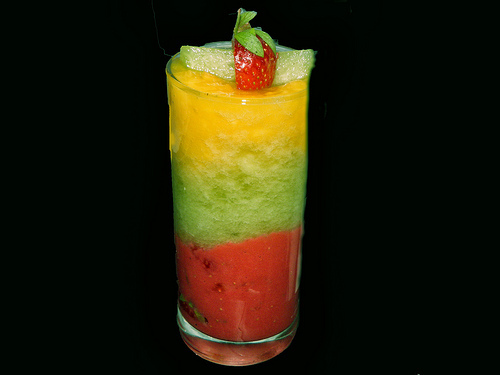 *Beautiful rainbow smoothie image courtesy of Mr. Fresh Eat Happy on Flickr.